For the past year, the Guadalupe MRT Station has been the site of the world’s largest air cleaning paint trial. The station was painted Boysen KNOxOUT, the world’s first air cleaning paint, and data from the trial indicates that the paint on the walls is cleaning the emissions of over 30,000 vehicles that pass by the area daily. As a result, the station has earned a most unlikely distinction. NOx, or nitrogen oxides, are harmful gases mostly generated from motor vehicle emissions. Trial data indicate that NOx levels in the vicinity of the Guadalupe MRT Station are at times over 200 micrograms per cubic meter -- a figure that’s more than 5 times that of the World Health Organization (WHO) recommendation of 40 micrograms per cubic meter. He notes that among those most at risk from the effects of NOx are vehicle drivers, traffic enforcers, field workers, garbage collectors and scavengers, and those with compromised immune systems including the children and the elderly. NOx are highly reactive gases, and is not only a health hazard in itself, but when it combines with other gases. In the presence of sunlight, it reacts with volatile organic compounds (VOCs) to form ground level ozone, more commonly known as smog. NOx also reacts with other compounds to form small particulate matter. Both smog and such particles cause respiratory problems such as asthma, bronchitis, emphysema, and reduction in lung function. Until the introduction of KNOxOUT, there has not been a way to clean NOx once it’s in the air. In an ironic twist, Boysen Paints and its technology partner, Cristal Global, developed a paint, which has long had a reputation for fouling the air, to actually clean the air. Cristal Global, the world’s leading producer of ultrafine titanium dioxide (TiO2), developed CristalActiv technology, which breaks down noxious air pollutants into harmless substances through an environmentally safe process called photocatalysis. The process requires only light and humidity for activation, and because the air cleaning TiO2 is merely a catalyst in the reaction, it does not get used up and is able to continuously clean the air. Cristal Global had been the supplier company to European Union funded consortium called Photocatalytic Innovative Coatings Applications for De-Pollution Assessment (PICADA), which did small trials that showed that the technology could indeed reduce the level of air pollutants in real life settings. Cristal Global were involved in several more trials in Europe – a tunnel in Milan, a school in London, and an indoor parking lot in Paris that all showed promising results". Cristal then worked with Boysen to do the world’s largest air cleaning paint trial in Manila. The trial was a partnership with the DOTC-MRT 3 and the MMDA, and involved painting the whole Guadalupe MRT station as well as an embankment wall opposite the station along EDSA. In all, over 6,200 sq. meters of area was painted with close to 740 liters of KNOxOUT. The trial was overseen by Conexor, a Swedish environmental project management company and the Manila Observatory, the Philippines’ oldest scientific research institute and a leading authority on air quality studies in the country. Data analysis was done by the Philippine Institute for Pure and Applied Chemistry (PIPAC) at Ateneo de Manila University. The trial involved 18 NO2 monitors, nitrate boxes, a series of traffic counting carried out by the National Center of Transportation Studies, and a weather mast to account for meteorological factors. 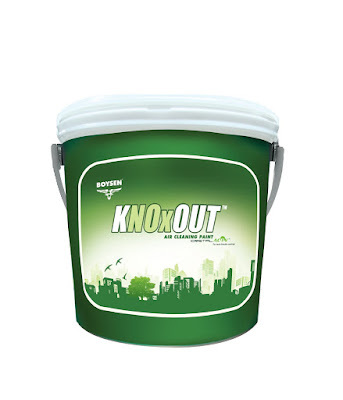 Data from the trial suggests that Boysen KNOxOUT, the first commercial paint in the world with CristalActiv technology, is cleaning the air at a significantly higher rate than those achieved in European trials. Initial estimates are that the KNOxOUT used in the trial will take out over 1,3 metric tons of NOx in a year. As the country observes the 10th year anniversary of the passage of the Clean Air Act, the need to clean the noxious air of Metro Manila has never been more urgent. A study of the World Bank and the Department of Environment and Natural Resources (DENR) estimates that up to 5,000 people die prematurely due to air pollution in the metropolis every year, accounting for 1 of every 8 deaths. Every little bit counts in the fight against air pollution. A study in Europe by APHEIS (Air Pollution and Health: A European Information System) found that even very small cuts in pollution can benefit health, and a recent Harvard University study found that people living in cities where air pollution decreased in recent decades saw their life expectancy increase an average of five months as a result of cleaner air. To find out more about air Boysen KNOxOUT and to find out which companies and citizens are stepping up to clean our air check out www.onewalloneworld.com.